FRAIDY MORRIS IS the perfect catch. Someone to envy. Or is she? HER mother-in-law is a better mother to her kids than she is. Who wants plain old mommy when you can have Super Savta? RUTHIE is feeling the pangs of empty nest. Her baby isn’t a baby anymore. Then she reunites with her old friend Chaviva, whose nest was never filled. THE bumps start early for newlyweds Hila and Yaakov. Is their marriage over before it’s barely started? WHAT is Michal to think when her friend Gila spent so much money on an over-the-top lavish vort, money that should have gone to paying back the rather large loan Gila took from Michal and her husband? Life is full of ups and downs. When the tide rises, we feel like we’re drowning in a tsunami. When the tide is down, everything that looked perfect on the surface is revealed, and nothing is the way we wanted it. But then sometimes, we find ourselves Between the Tides. And it’s in those rare moments that we can take a deep breath and prepare ourselves for the next wave. There’s nothing more satisfying than fiction that captures the ebbs and flows of life perfectly. There’s nothing more satisfying than Sara Wiederblank fiction. With this riveting collection, including new, never-before-published stories, Sara Wiederblank never disappoints. THERE’S SOMETHING WONDERFULLY astonishing about reading Sara Wiederblank’s stories: I always find a little part of me in them. I begin reading the story thinking that it’s only fiction, and I let my guard down. But then I find myself getting swept away by the characters and their lives. Suddenly, I am one of them. Or my child is. Or my neighbor is. 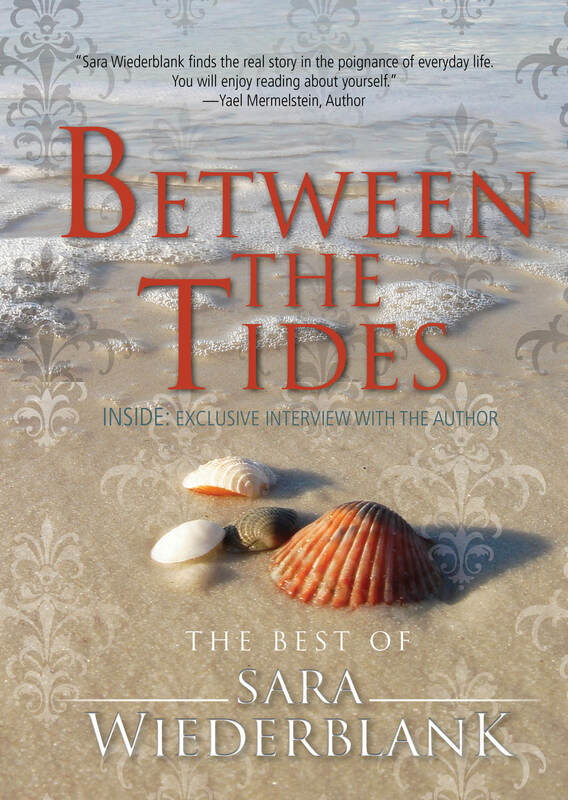 In her most recent collection, Between the Tides, Sara begins with the tale of Breindel, who gets a gift set of Cutco knives from her friend Daniella. She knows nothing about this high-end item that’s supposed to make her life in the kitchen a breeze. Forget what happens next, I’m Breindel’s best friend already! In real life, although I don’t like to admit it, I don’t know the difference between the many knives in the housewares department (or the pots, I’ll admit if you promise not to tell! ), and so I connect with this story, with its author and her message. “The Committee” is another Wiederblank classic. It has her signature humor and wit that makes me crave the couch and then has me sitting there completing the book in one sitting. What is it about the story of slob meet perfectionist that intrigues and inspires me? Is it because it’s not about the mess but about her wobbly self-esteem? Is it because I want to tell her that Naama can’t be perfect in every way, only to realize that I am no different than she is? The author is a realist. Her stories are not compromised of sensationalist plotlines. They are portrayals of characters we love and hate, admire and fear, have run away from and chased… But it’s her sense of humor that had me hooked. In the final story, “The Envelope was Thin”—about a girl who was rejected from the seminary of her choice and how she and her parents handle it—Sara opens with “Ahuva Greenwald couldn’t believe it. They didn’t want her.”And I am angry for Ahuva. I want to go after those who have rejected her. But then I get to know her mother and I learn how misplaced my fight for the perceived “justice” is. I’m glad the interview with the author is left for the end of the book because as I completed the last story, I realized I had questions for her. Lots of them. In the interview, she answers some of the questions I had, and as for the others, I e-mailed her about them. I suspect they may be the basis for another story. SARA WIEDERBLANK was raised in Brooklyn, New York, and currently lives in Washington Heights with her family. She divides her time between teaching high school limudei kodesh, writing, and caring for her family, though not necessarily in that order. She has published two books for young readers, Save Our School and Seven Up, as well as two novels for adults, Just Between Friends and Pass or Fail. She is a frequent contributor to Binah magazine, where she writes short stories as well as serial novels. I’M SO EXCITED! I’m bursting to tell someone but, of course, I can’t. I mean, not yet. It isn’t official yet, though I have dropped a few hints here and there. I think it’s okay, because by tomorrow everyone will know, and they’re already looking at halls and thinking of a date and all that. I mean, they’re so past that uncertain stage. But still, I’ll be a good girl and hold my tongue. When the news breaks, the whole town will be humming. Everyone knows Talia Mayer. She’s well known for the beautiful professional photography she does, and her parents are prominent askanim in the community. Many of the prestigious families in town are related to her. And everyone loves her. She’s so gracious and intelligent and beautiful and kind. Her single state has been eating people up all these years. It’s been ages since the last of the girls from our high school class—we were seventeen altogether—got married, and I think lots of us had given up hope on Talia. It wasn’t as if new prospects showed up so regularly anymore. For whatever reason, nothing had worked out. What was there left to try? Of course, she wasn’t getting any younger. And since ours is a small town, everyone knew her exact age. They probably also knew her birth weight and how old she was when she first rolled over, for that matter. But I’m getting off topic. The main thing is, now she’s about to get engaged! To a really wonderful bachur: Gedalia Moskowitz. Someone with a phenomenal reputation and for whom things just hadn’t worked out yet either. And—here’s the really exciting part—Malky Horowitz made the shidduch! That’s right— me, Malky Horowitz! After years of dabbling and trying, I finally made my first shidduch, and it turned out to be for my good friend Talia Mayer! It’s been so sad all these years. I really tried my best to be a good friend to her. Though I must say she kept her spirits up pretty well. I think I was very sensitive to her, even though our lives developed so differently. I mean, my daughter Zeesie is already nine years old. I have five children and she’s just getting engaged. What a simchah! It’s going to feel a little strange when people come up to me and congratulate me on making the shidduch. Because it wasn’t exactly our idea. It’s true that my husband Reuven knew Gedalia from camp ten years back. But he never thought he might be a match for Talia. It was actually a different friend, Menucha Spektor, who thought of it and suggested it to Talia. But Menucha didn’t feel comfortable speaking to Gedalia, so she asked us to suggest the idea. Reuven didn’t think Gedalia would take him seriously. After all, they hadn’t spoken more than twice in ten years. But Gedalia said yes right away, and before I could blink, they were going out. It’s true that Rebbetzin Ginzburg, the wife of the mashgiach ruchani in Gedalia’s yeshivah, who also happens to be an old friend of Talia’s mother and a very influential shadchante, suggested the same idea to Gedalia right around the same time. So I’m not actually sure which person pushed Gedalia to accept the idea. But my husband and I were the “go-betweens,” and we handled everything along the way. Not that there was much to handle. It went pretty smoothly from the very beginning. But still, a shadchan is indispensable. Like I said, I’ll feel a little strange accepting all the credit. Probably I’ll just shake my head happily, accept the congratulations gratefully, and then maybe say something like, “You probably heard that the Spektors and the Ginzburgs had a little bit of a hand in it, too.” Yes, that would be the right thing to do. I don’t think it will take away any of my glory as the shadchan. If anything, it will make me look modest and self-effacing. Like I’m trying to make sure other people get credit, too. Not that the credit matters at all. The main thing is that Talia is getting engaged after all these years. Who cares who made the shidduch? I would hate to use such a happy event as an opportunity for self-aggrandizement. I almost hope, in fact, that no one talks to me about making the shidduch. I don’t want to sully the joy of this occasion with self-centered considerations. Though I do wonder, just a tiny bit, if the Mayers intend to give a check or a gift for shadchanus gelt. Not that I would expect anything—I would have done anything for Talia, at no charge—but it is the custom, and money would be nice. The only problem with money is that since we are always a little in debt, it will go straight to something boring like paying our credit card bills or school tuition for the boys. We won’t even notice that we got it. Reuven would be happy with that, but I feel that if we made a shidduch, we should treat ourselves to something we enjoy. Don’t tell anyone, but if Talia would give me a gift certificate for a furniture or houseware store, I would be thrilled. I have only very simple things, still from my kallah days. Reuven’s family never had much money. And I think all these years Talia has kind of felt sorry that my apartment is so dilapidated. Enough of this. Who cares anyway? Talia is engaged! She’s getting married! My oldest friend! Do you know what this means? She’ll have a home of her own, children of her own! I am so filled with joy, I’m bursting. I wish they would hurry up and make it official already so I can tell the whole world. The phone is ringing! Let me run and see if it’s…AAAAHHH! It’s her! I JUST CAME back from Talia’s vort, and I’m feeling strange. I’m not sure why. It was an utterly beautiful simchah, after all. The Mayers just know how to do things. The décor was perfect. They had a pink-and-brown theme, and everything coordinated with everything else. It was a real contrast to mine, which was kind of slopped together at the last minute. It never even occurred to us to have a theme, and we certainly didn’t have any chocolate miniatures. Not that I’m jealous of Talia. What’s there to be jealous of? I have five children and a wonderful husband. I didn’t have to wait like she did. Okay, it’s true that Reuven is not such a well-known “catch” like this Gedalia is. But Gedalia was on the market for many years, so he had a chance to build up a reputation. Reuven and I were young kids, just starting out. No, I certainly have no complaints. It’s just that by now my life is a little more humdrum. There’s no real mystery left in it anymore. We’re kind of established, and our heads are not up in the clouds like Gedalia and Talia. Hey, they even rhyme—Gedalia and Talia, Talia and Gedalia. Not that I envy them with their heads in the clouds. No, I don’t. I’m so glad to be past all that. All those engagement stresses and the challenges of shanah rishonah and the tensions of a first baby… I’m practically sighing with relief and gratitude that I’m not in Talia’s shoes. But I must say, she looked so happy. All those years of waiting have been vindicated. They were all glowing, the Mayers. And that’s the part I felt funny about. Let me see if I can describe it accurately. I walked into that vort like a conquering hero. Because I really was the hero of the evening—not that vorts have heroes, but if they did, it would definitely be the shadchan. I walked into the room and waited for someone to notice me. But the Mayers were clustered together talking with various people, and Talia was sitting with her grandmother, engrossed in conversation. So I pushed myself through the throng to Talia’s mother. She noticed me finally and smiled. I gave her a kiss and demurely wished her mazel tov. “Thank you, beruchah tehi,” she said, and looked over my shoulder to see who had come in next. I was a little surprised. I smiled modestly, all the while thinking, A hand in it? A bit more than a hand, don’t you think? But perhaps Talia hadn’t shared too many of the details of the unfolding shidduch with her mother. I went over to Talia next. She had finished with her grandmother and was speaking to a different woman. “I heard you had a really chashuve shadchan, dear,” the woman said. “Beautiful,” pronounced the woman and sailed off. You could have knocked me over with a feather. Rebbetzin Ginzburg made the shidduch? Since when? I mean, who gave information to both parties? And arranged the first dates? And took down and reported the feedback? And ran the numbers through Dor Yeshorim? And offered the almost-kallah words of chizuk? Bimechilas kevodah, I do not think it was Rebbetzin Ginzburg! Okay, I mean, I realize it sounds better to say, “Rebbetzin Ginzburg our shadchan,” than to say, “My sweet little friend from high school, Malky Horowitz, made the shidduch.” Look, if it were me I would also want to say Rebbetzin Ginzburg made my shidduch. It’s just that it isn’t true, and that’s what bothers me. They aren’t telling the truth. Why can’t they just say what happened? Is my name not exciting enough for this event? It has nothing to do with me, but it bothers me when people are not completely honest. Of course, it could be I don’t know the whole story of the shidduch from the perspective of the chassan. Maybe Rebbetzin Ginzburg was more involved than I realized. I have heard that she is really talented in these matters and the bachurim take her very seriously. But I was definitely the shadchan! Anyway, like I said, not that it matters. I’m just so glad for Talia, I don’t care how it came about. It’s an even bigger mitzvah if I don’t get all the credit for it. When I went to hug Talia, she thanked me warmly for my role. It’s not as if she isn’t appreciative. A little later, some of our old friends from high school trickled in. Baruch Hashem, everyone is busy with a life of her own, but we were a close-knit group, and girls really tried to make the effort for Talia. She had participated so beautifully in our simchahs all those years ago, and we were happy to finally reciprocate. I was looking forward to being a bit of a hero to our high school class. I mean, I’m just Malky Horowitz. I did fine in school, and I had lots of friends and all that, but I never did anything so special. Now I’d done something special. I made a shidduch for the glamorous and popular Talia Mayer. Me! I did it! But though they were all happy to see me, none of them seemed to realize that I had been involved. I don’t get it. Who did they think made the shidduch? Weren’t they at all curious? Isn’t that one of the first questions people ask? But they all came over to me and kissed me and exclaimed how big Zeesie was getting and how nice it was to see me and how excited they were for Talia—and that was it. I smiled modestly, all the while thinking, Legwork? What am I, the errand boy? But as the evening progressed, I realized that no one seemed to know any more about it than Avigayil did. I kind of told some people, and Talia kind of mentioned my role to some other people, but I kept hearing about Menucha Spektor and Rebbetzin Ginzburg over and over again. I left the vort a little earlier than I had planned. I’m not sure why. I sure would like a new set of china like the one Avigayil Pollack said she had just bought. I wonder if I’ll be able to buy one anytime soon. I’m really so happy for Talia. It’s so beautiful that after all this time, she’s finally getting married. It’s also nice that I had a role in it. But the main thing is that she’s engaged. Whether or not I was involved, and whether or not people know about it, the main thing is that Talia’s a kallah. I just wish I believed myself, that’s all.